NEW BRITAIN - Mott Corp. will be distributing Christmas gifts to 70 young clients of the Wheeler Clinic on Saturday, while the New Britain Bees will be collecting toys and canned food to donate to The Salvation Army. The Bees’ holiday-season donation drive will take place from 10 a.m. to 3 p.m. at New Britain Stadium’s gift shop at 230 John Karbonic Way. Canned food and toys will be donated to The Salvation Army, whose members will distribute them to needy New Britain families. The event will include visits from Santa Claus and Sting, the Bees’ mascot. The event is being organized by the New Britain Bees front- office employees, who want to collect as many toys and cans of food as possible, Tony Gionfriddo, the team’s sales director, said. “New Britain is our home and we love to give back to our community,” Gionfriddo said. Each person contributing toys or cans will receive four tickets to the Bees’ 2019 home opener, on May 3 at 6:35 p.m. The Bees will also host a Junior Achievement night for the first time in 2019. Other promotions will include a cancer awareness night with the Boys & Girls Club and education night for New Britain students on May 15 and for students in surrounding towns on May 29. Boy and Girl Scouts will have a stadium sleepover on June 22. For more information, contact the Bees at 860-826-2337 or info@nbbees.com. 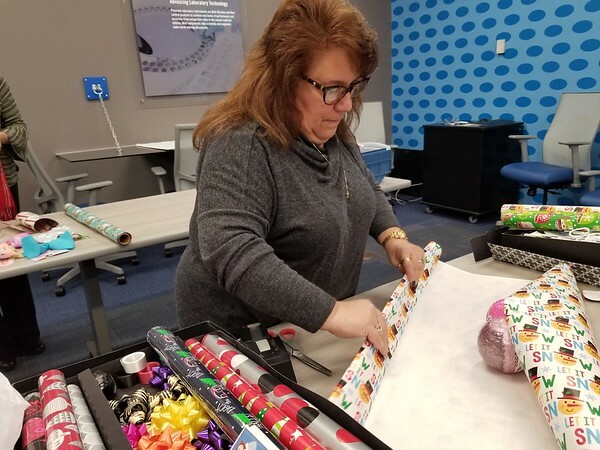 Mott Corp. wrapped gifts for 70 children Tuesday. They will be distributed to children receiving foster services from Wheeler Clinic on Saturday afternoon during a holiday party. Chris Holm, Mott Corp.’s vice president of human resources said the company has had a 20-,year-relationship with the Wheeler Clinic. Mott employees provide support to Wheeler’s activities and Christmas gift program. Mott had a Christmas tree decorated with tags bearing the name and gender of each child to be given a gift. Employees volunteered to take at least one tag and buy a present for the child it represented. 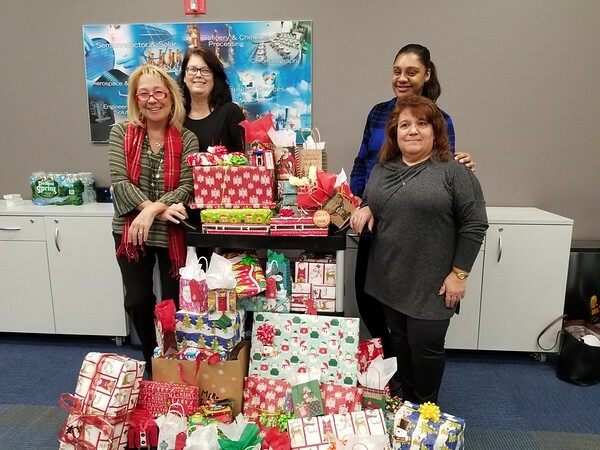 About 70 percent of the company’s employees wound up contributing gifts. “We have a very caring employee group here,” Holm said. John Sponauer, vice president of marketing communications at the Wheeler Clinic, said he is thankful for Mott Corp. because its generosity fills a great need. He said more than 4,800 children are in foster care each day across Connecticut. To learn more about the Wheeler Clinic, visit www.wheelerclinic.org . Posted in New Britain Herald, New Britain on Thursday, 6 December 2018 00:18. Updated: Thursday, 6 December 2018 06:24.